In The Eyes Of The Beholder: A Beautiful Award From Ate Bing! A Beautiful Award From Ate Bing! I haven't been tagged an award for quite sometime. 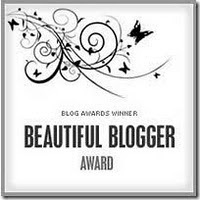 And receiving such an award from my one of my most admired blogger is very flattering. Bingkee of I Love/Hate America whom I fondly call Ate Bing is a blogger who's intelligent and honest and it basically shows on each of her articles. Unfortunately, some people just don't like her honesty. They are the hypocrites and the "negas" (negative people) who are narrow-minded and not open to other people's idea. There are a lot of them actually. Not only in the Blogosphere but in real life. I love to eat steamed corn kernels. Whenever I find one in the grocery store or just around the corner of a street, I really get tempted to buy one. I don't like noisy-self centered people. They irritate me. I want to find a good job that can pay me better so that I can take all my Mom's worries away. I was given an award at work for not being absent for the whole year last year. Too bad the company don't have incentives for perfect attendance. I'm a good listener but sometimes I also wanna be heard. Isn't it nice? Thank you so much Ate Bing! Hi Ally! Happy Birthday! I have a post up for you wishing you well on your day! Unfortunately, online pests are something every blogger has had to deal with though not many have dealt with as much of it as Bingkee. Very well said there. I know what you mean about getting a better paying job, but at least you do have one. I thought you did well enough as Studio Coordinator in Bingkee's movie to make more money. Maybe a blog acting career would work for you. LOL! Only kidding, and how I wish that were true.